If you’re a child of 80’s video games like me, few games likely bring back more traumatic memories of horrifying difficulty than Ghosts ‘n Goblins. While the game was originally released in arcades in 1985, it wasn’t until 1986 that Ghosts ‘n Goblins cursed the NES with its presence and quickly grew in fame as one of the most difficult games of all time. Over the years there have been many sequels, ports, and remakes of the game with the most recent being Ghosts ‘n Goblins Gold Knights [App Store] for the iPhone. So what has changed over the years? Well, the most noticeable thing are the sprite-based graphics from days of old have been replaced with a 2.5D world with all kind of new animations and environmental effects. It’s hard to say how much this improves the game though, as the textures are low resolution, the animations appear to be almost intentionally ridiculous, and what’s worse is the game doesn’t run very smoothly even on my iPhone 3GS. The difficulty has been significantly decreased from the original. You can now absorb multiple hits from enemies before dying, and there are a whole array of additional weapons and power ups to be found in the game. Unfortunately, it seems that most of the challenge in the game now comes from negotiating the inherent lack of precision in the virtual D-Pad controls. Similar to how we felt about Earthworm Jim, if your memories of Ghosts ‘n Goblins involve a physical D-Pad, you will likely have an uncomfortably awkward adjustment period of missing jumps and falling in to pits. Because of the increased life bar and chests with power-ups littering the game, the only real threat that the monsters you come across pose is knocking you backwards in to a pit. 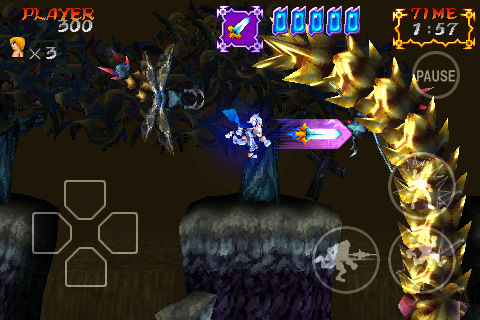 At the end of each level there’s a boss, but the gimmick of each boss only amounts to dodging different things. Levels feature multiple check points, and it seems like there’s always a checkpoint just before a boss so if you don’t beat them the first time you will almost assuredly beat them the second. There is an in-game store where you can buy access to various cheats for 99¢ each. These cheats range from infinite lives to stronger armor and weapons. Unfortunately, there’s no “don’t fall in pits constantly" cheat you can buy, so none of them seem really that useful. Since after you die you’re able to select the last level you were on and start from that point, even having infinite lives doesn’t help that much. Despite the game’s many flaws, it’s still Ghosts ‘n Goblins. Everything from the map scrolling across the screen between deaths to your guy running around in his underwear when you take enough damage to lose your armor is in place. If you’re into nostalgia, Ghosts ‘n Goblins does deliver but, otherwise, the iPhone version of the game can’t really stand on its own. If this is the first you’ve heard of Ghosts ‘n Goblins, you’d probably be better off playing it on a real console with a real d-pad.